Flu season is just around the corner. As winter approaches, the cold forces us into the warmth of our homes, where interactions with our fellow humans are magnified by increased close contact. These conditions are ideal for the spread of the influenza virus, which is mainly spread by sneezes. A tear-inducing, room-resonating sneeze is a viral ejection of massive proportions. It starts with a tickling feeling in the nose, grows with each vain attempt at repression of the inevitable, and ends with the violent expulsion of as many as 40,000 projectiles traveling up to 200 miles an hour. Each droplet expelled into the room can contain as many as 100 million flu viruses. The virus-laden water bombs are also released in much less dramatic fashion when someone with the flu talks or coughs. After expulsion from the infected body, the larger droplets fall to ground, while the smaller ones can remain airborne for days. Most flu viruses are spread when these droplets directly enter someone's mouth or nose. It is a common misconception that flu infections come from touching doorknobs, handrails, etc. -- infection from droplets that have landed on a surface is fairly rare. During the summer, we spend more time outdoors, where we are less likely to breathe in virus-laden droplets. Consequently, outbreaks of the flu are generally limited to the winter season. They peak in about three weeks and take another three to dissipate. In the period between 1976 and 2006, annual flu-associated deaths in the United States ranged from a low of 3,000 to a high of 50,000 people. According to the Centers for Disease Control and Prevention, older people, young children, pregnant woman and people with asthma are particularly susceptible to flu viruses and are at greater risk for serious complications. The annual direct medical costs attributable to the flu in the U.S. average $10.4 billion annually, and the projected lost earnings due to illness and loss of life amount to $16.3 billion. At least four times in recorded history, a flu outbreak has swept across the world, infecting a significant portion of its population. Such outbreaks are known as pandemics. The most recent pandemic was the 2009 flu pandemic, known as the swine flu because the virus had been circulating amongst pigs before infecting humans. On March 28, 2009, Mexican health authorities reported the first indications of the flu epidemic. Five months later, close to 50 million people around the world were infected. This flu was very efficient at moving from person to person; fortunately, it was not a very deadly pandemic and less than one in every 1,000 people infected died. According to John Barry, author of The Great Influenza - The Epic Story Of The Deadliest Plague In History, in 1918, a combination of the coldest winter recorded in the midwestern states of the U.S. and the mass movement of people brought about by World War I resulted in the world's worst flu pandemic. It is commonly believed that the 1918 pandemic started in Camp Fulston, Ks., where like most army camps at the time, the "barracks and tents were overcrowded and inadequately heated, and it was impossible to supply the men with sufficient warm clothing." The 1918 influenza pandemic struck in two waves. The first started in the spring of 1918 and the second in the fall of that year. The second wave was unlike any other flu outbreak ever seen. The coughing and sneezing was so violent that autopsies of victims often revealed torn lungs and burst eardrums. Many patients bled from their eyes, noses and every other orifice. More people died in one year of the 1918 flu than were killed by a century of black death. About a third of the world's population was infected. It is estimated that between 50 and 100 million people died from the flu, which was more than three percent of the world's population at the time. Most of the victims were young healthy adults. In 2005, tissues from autopsied lung tissues and from the frozen lung tissue of an 1918 flu victim who was buried in the northern Alaskan permafrost were used to determine the complete genome of one of the viruses responsible for the 1918 pandemic, and the partial sequence of four others. This allowed researchers to suggest that the 1918 flu virus originated in birds and that sometime between 1880 and 1912 it crossed over from birds into mammals. The bird flu virus is lethal when it infects humans, but fortunately it does not spread very well. In contrast, the swine flu virus is incredibly efficient at moving from person to person, but its fatality rate is low. Virologist and epidemiologists fear hybrid viruses, such as a deadly avian virus with improved transmissibility. Such a hybrid virus has been formed before and will most likely occur again. We know that when two different influenza viruses inhabit the same cell they can exchange gene segments, and completely new hybrid viruses can be formed. This increases the chance of a virus evolving in leaps and bounds. For example, both human and avian viruses can infect pigs, and if they both infect the same cell in the pig, they can swop gene fragments, thereby creating an avian flu virus that is capable of infecting humans. Ron Fouchier, a virologist at the Erasmus Medical Center in Rotterdam, Holland, and Yoshihiro Kawaoka of the School of Veterinary Medicine at the University of Wisconsin in the United States have shown that it takes only five mutations to transform the bird flu virus into a form that is transmissible from mammal to mammal by coughs and sneezes. Two of the five mutations have already been found in wild birds -- which means that some avian virsuses are just three mutations away from becoming transmissible between mammals. The bird flu virus acts differently in humans than in its native host. In birds it infects the gastrointestinal tract and not the lungs. As a consequence, bird droppings can harbor significant amounts of the avian virus and they can contaminate lakes and ponds. In 1996, a new influenza virus was found in domestic geese in China's Guangdong province. Since then, the same avian virus has become endemic to bird populations of six countries and has been found in 57 other countries. Very occasionally, some of them have made the transition from birds to individuals working on chicken farms. The cross species jump is rare and the only victims have been people with extensive contact with infected poultry. So far this year, only 30 people have been infected by the bird flu virus, but 19 of them have died. According to Peter Palese, a virologist at Mount Sinai School of Medicine in New York, "Infection and disease are not directly proportional to exposure. Ninety-nine point nine percent of the people who are massively exposed don't have [the] disease, and don't have antibodies in their blood. But in people who get sick, the virus replicates like crazy." Imagine if this deadly virus started moving from person to person. Controlling avian flu in wild birds is an impossible task, however limiting its spread amongst domesticated ducks and chickens -- the most who are the most common bridges to human infections -- may soon be possible. This is due to a project Laurence Tiley, a molecular biologist at the University of Cambridge, and Helen Sang, an expert in genetically modifying chickens at the Roslin Institute in Scotland, are working on such research. They have created genetically modified chickens that limit the transferal of the avian flu virus between chickens. Right now, this is just a proof of concept experiment. Tiley has no intentions of selling his transgenic chickens to poultry farms in the next few years. If he can improve his technique so that the transgenic chickens cannot transmit a single virus or be immune to infection, then transgenic poultry may be ready for the market. He says, "We have more ambitious objectives in terms of getting full flu resistance before we would propose to put these chickens into true production." 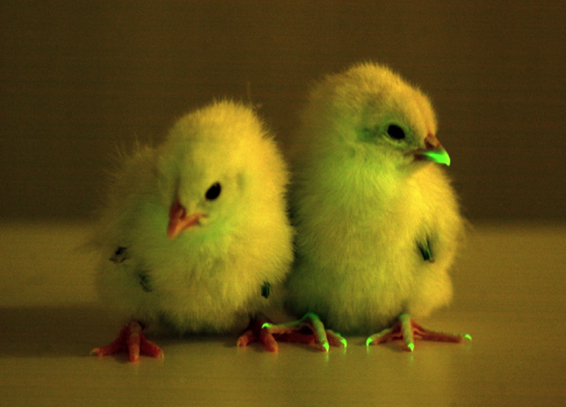 The transgenic chickens created in this research may have the best chance of any genetically modified organisms at being used to combat a disease. This is because chickens bred in the poultry industry are isolated from wild chickens and birds, and there is little chance that the genetic modifications will enter free-range chickens. Transgenic chickens are much more isolated than genetically modified plants, whose pollen freely blows in the wind. Additionally, the consequences of a bird flu pandemic are so severe that they might justify the widespread adoption of genetically modified chickens. The flu has created an interesting dilemma for us. The pressure our civilization is placing on nature and the way we are changing to mega-farms is increasing the likelihood of an influenza outbreak. However, to reduce the probability of an influenza pandemic, we can either reduce our population and our meat consumption, or we can tinker with nature by creating genetically modified poultry. Soon we might have to decide whether we are willing to accept genetically organisms as our allies in the fight against diseases such as the flu. Image courtesy of Helen Sang, Roslin Institute.